Were you part of the 14,000 people who came and worshiped the Lord at the Hillsong United Aftermath concert in Araneta Coliseum last June 2? I was! Thank God for that blessed night where I had the time to just sing my heart out and praise Him through music. Perhaps not many of you know that I lead worship in my church -- Grace Gospel Church -- once a month. It started once every two months in 2010, but later on became a monthly thing. Being one isn't all about singing and leading skills. It requires me to constantly seek higher learning from God and build a better relationship with Him day after day. 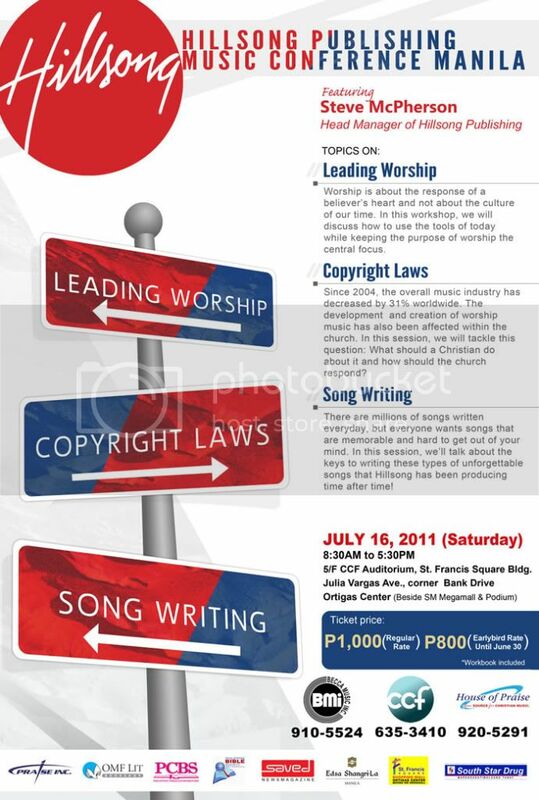 This July 16, 2011, there's gonna be another must-go event headed by Becca Music Inc. called the Hillsong Publishing Music Conference Manila, happening at 5/F St. Francis Square from 8:30AM to 5:30PM. The conference will feature Steve McPherson, Head Manager of Hillsong Publication and co-writer of a popular Christian music "Jesus, Lover of My Soul." He will be speaking about three useful topics --Leading Worship, Song Writing, and Copyright Laws. This is a great venue for church servants to gather together and learn insightful knowledge that will truly help create a wonderful worship atmosphere in church.